There are many reasons drivers in Knoxville and Sevierville are taking a serious look at the new Toyota lineup. In addition to the rugged independence of models like the Toyota 4Runner and the head-turning style and performance of the all-new Toyota Camry, these vehicles are also equipped with groundbreaking automotive technology. Entune™ is a series of infotainment suites that are designed to make trips around town easier and more enjoyable for drivers and passengers alike. See what you can expect to find in each of these multimedia suites at our Toyota dealership in Morristown. Scout®GPS Link – Based on a smartphone app that’s integrated into the Entune™ multimedia screen, Scout® GPS Link provides you with intuitive turn-by-turn directions to any location around Morristown. JBL® Audio – Available as part of the Entune™ Audio Plus with JBL® package on the new Camry, this premium sound system utilizes GreenEdge™ Technology and Premium Surround Sound to create an audiophile’s dream inside the cabin. Entune® App Suite – This advanced App Suite provides you with a full range of features, beginning with access to all the best apps. Discover new music with apps like Pandora® and iHeartRadio or even place a dinner reservation with OpenTable. You can also order tickets to a flick with MovieTickets.com, find a gas station and compare fuel prices, and even find a specific business or point of interest just by saying its name. 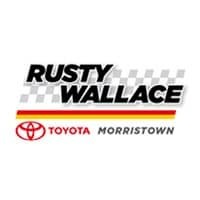 Whenever you’re ready to explore the fun and ease of Entune™, simply take the drive to Rusty Wallace Toyota and allow a member of our knowledgeable sales team to guide you through the many functions of these advanced infotainment systems. Contact us with questions or to schedule an appointment.